PHOTOS: Cunard's celebrity photographs set to go under the hammer -- An “exceptional” collection of star-studded photographs taken aboard Cunard ships and showing movie icons such as Elizabeth Taylor and Richard Burton is going up for auction. The collection was the result of 20 years work by George Ruff during his time as official photographer in first class aboard the Cunard cruise ship line, based in Southampton. Much-loved comedy duo Eric Morecambe and Ernie Wise also feature in the unique set of about 50 images, many autographed, along with Hollywood legends such as Telly Savalas, Bette Davis, Deborah Kerr and Robert Mitchum. Known as something of a character, Mr Ruff struck up an easy rapport with many stars and was able to capture a glimpse of the bygone glamour of the 1950s, 60s and 70s. During a voyage aboard the RMS Queen Mary, he shared drinks with Mitchum and took his picture. On another occasion, Mr Ruff was invited back to actress Deborah Kerr’s cabin for a party with friends. Kerr, who had starred opposite Yul Brynner in 1951’s The King and I, was a huge star at the time and took a shine to Mr Ruff, introducing him as “my friend, George”. Other photographs in the collection include Mr Ruff towering comically above funny-men Morecambe and Wise as well as shots of Buster Keaton, Anthony Quinn, Victor Mature and Phil Silvers. The images, many in black and white and shot aboard the Queen Mary, RMS Mauretania and QE2, are due for auction on September 30.
during the Second World War, staying on until 1947 to help capture Nazi war criminals. The photographer, who along with his wife Marion was an extra in Richard Attenborough’s Oh! What A Lovely War, died aged 79 in 1997, with his ashes scattered at sea. Mr Ruff’s nephew Robert Vercesi, 72, from Walsall, West Midlands, is now selling the unique collection as the family felt it was “time to share”. He recalled the story behind the colour photos of a relaxed and smiling Burton and Liz Taylor, taken “just as they were boarding the ship”. Mr Ruff also met singer Shirley Bassey, British comedy double act Flanagan and Allen, American singer Rose Murphy, playwright and actor Noel Coward and Britain’s first teen idol Tommy Steele. 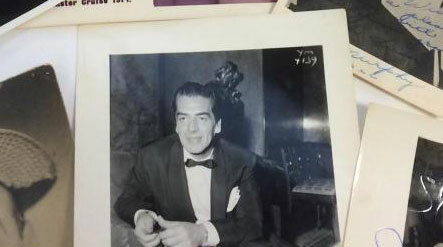 “The stars liked my uncle because he was such a big character and full of stories,” added Mr Vercesi. He said: “He loved working on the ships and in 1970 he asked if I’d be his assistant on the QE2. “Apparently, the assistant he had couldn’t cope with getting up at 5am to process the pictures taken of guests the night before. The former police officer added: “Until now, the collection has only been seen among members of our family. Charles Hanson, owner of Hansons Auctioneers, said: “This is an exceptional private collection of images featuring some of the most famous faces the world has ever known.